Los Angeles – June 25, 2015 – UFCW activists from across North America recently gathered to honour retired UFCW International President Joseph Hansen as the inaugural recipient of the Bill Olwell Champion of Equality Award. Edmonton, Saskatoon, and Winnipeg – June 15, 2015 – UFCW activists proudly stood in solidarity with their LGBTQ brothers and sisters at recent Pride celebrations across the Prairies, from Edmonton to Saskatoon to Winnipeg. Toronto – June 12, 2015 – Advocating for respect, dignity, and LGBTQ rights in the workplace – and throughout society – is a core value of UFCW Canada. 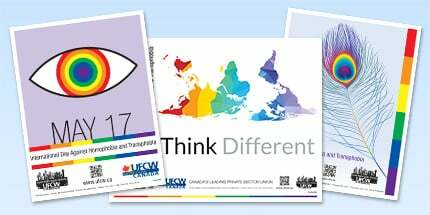 Ottawa – June 4, 2015 - UFCW Canada supports the passage of Bill C-279 — as originally passed by the House of Commons — to protect transgendered people against hate crimes and discrimination. Toronto – April 7, 2015 – The International Day of Pink started as a high school initiative, and has since evolved into an annual day across the country where people wear pink and stand in solidarity to raise awareness to stop homophobia, transphobia, transmisogyny, and all forms of bullying. Washington, D.C. – December 18, 2014 – UFCW's LGBTQ constituency group OUTreach held their executive board meeting recently. During the meetings, executive board members discussed a number of topics regarding LGBTQ advocacy.